In Pakistan, many people have complained about the lengthy process of registering their private companies. They complained that they did not understand all the steps needed and complained about the ridiculously high rates professional companies were charging for helping them set up their own companies as new ideas. This is largely due to the fact that there is a lack of information and understanding among the new entrepreneurs and thus they end up paying high fees to have their private companies registered. 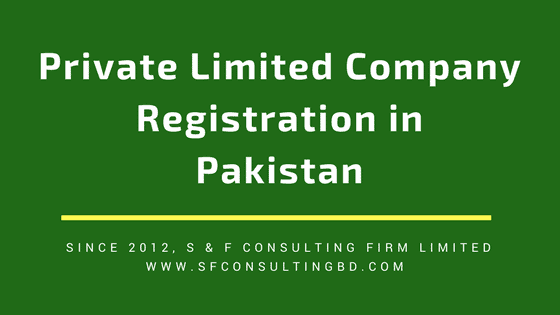 With so many confusions and questions in mind, we have decided to explain to you private limited company registration in Pakistan in only a matter of 5 steps. SECP E-Services Portal: If you wish to register your private limited company online then you should log into the SECP eServices Portal. The cost of registering online is significantly lower than doing it offline. In fact, you could save around 50% of the usual cost by registering online. Step 1: The first step of the private limited company registration in Pakistan and process includes reserving your company name. This is a very crucial part of your entire business setup. Come up with a different name and preferably something that hasn’t been used before. Use the SECP’s Company Name Search to see if your desired name is available or not. You will need to fill out a form which will cost you Rs. 200 which can be done with a credit card or through your bank. Make sure you mention what kind of company you are planning to register the name for. Once the name registration is done, you will be sent an email confirming your registration in the next two to three days. You can either pick up your Company Name Reservation Certificate from the concerned Company Registration Office (CRO) or have it delivered to you in the next 4 days. Step 2: The second step of the registration process is the document verification. During the time of incorporation, you will be needed to file the Memorandum and Articles of Association. It is wise to have the draft o these documents written down before you apply for your name. The Articles of Association require the three forms which are 1, 21 and 29. FORM 29: All sorts of general information such as names, national identity cards and other basic data of all Directors and Officers visa for foreign shareholders. This includes the Chief Executive as well as the Secretary among other people. Alongside the MA and the AA, your document verification will need the scanned copies of your National Identity Cards of all your directors as well as the scanned receipt of your bank deposit. Step 3: When you are registering your private limited company through the E-Services, all your documents will be signed by the NFIT. A digital certificate from the NIFT will be provided for each director you have to the company and they will need to electronically sign out all the documents they provide for registering the company. These will include the Memorandum, Articles, and all other forms you have filled out so far. Once you get your Name Reservation Certificate from SECP you will have to send that application to NIFT to get the digital certificates. Step 4: Fees for registration is the next step on our way to register a private limited company in Pakistan. You can use the Incorporation Fee Calculator in the SECP E-Services and find out how much you have to pay to register your company. The fee is usually pegged with your share capital. If you pay the fees physically, i.e. offline then you will need to scan the bank deposit receipt and upload it online before you complete the process. If you are doing the whole process online then there is an online payment section from where you can make your payments. Step 5: The final step of incorporating your private limited company in Pakistan is a very simple process of issuing your certificate. If there are no problems with all your documents and payments and you have filled all the applications properly then you will be issued your Certification of Incorporation within a few days. However, if there happens to be a problem of some sort, then you will be asked to make some adjustments and changes. You can make those corrections via the E-Services of SECP. This correction should not take more than 7 working days to implement and once they are done you will receive an email stating that your registration of your business was successfully done. An incorporation number will also be provided to you in your email. Now all that is left is for you to pick up your Incorporation Certificate from the Company Registration Office. Just show your copy of the payment slip and your certificate will be handed over to you.